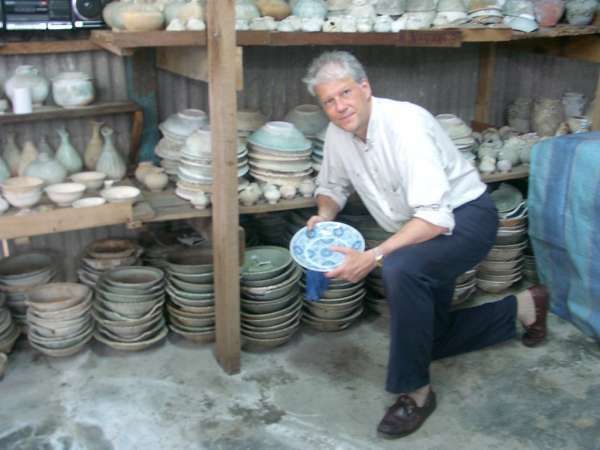 Jan-Erik Nilsson in front of some pieces recovered by Sten Sjöstrand from the "Royal Nanhai" 16th century cargo of Thai Celadon ceramics. 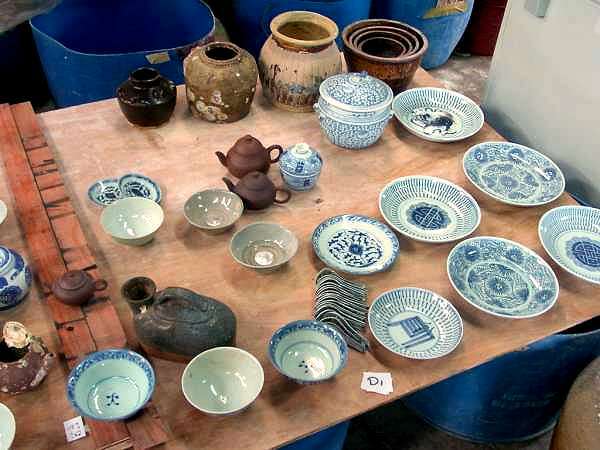 The blue and white plate is from the latest of his discoveries - a full cargo of what seems to be a very diverse Chinese Junk cargo from the first quarter of the 19th century intended for Singapore or Batavia. A few days ago I mentioned I would try to visit the base camp of Sten Sjöstrand's marine archaeological and salvage expedition in Malaysia. Well. I did and I am back. I have just had a much needed shower and rested some, and thought I should come back to you now and tell what happened. The travel directions I had got was scanty to put it mildly and I had really no idea how far it would turn out to be or how complicated it would be to go see him. We had chit-chat-ed some via e-mail and indicated it was easy - just grab a cab and travel for some two hours. As the locals would have it; Yah, right. In some sense it was just that. Anyway, a few days ago, I sat outside the hotel here in Singapore and tried to figure out how to go about doing this. Since I didn't know where I was going - or how far it would actually turn out to be - I decided that the easiest way to find out was to get going. After having consulted with the Hotel, some friends here and called a local bus company - and still not knowing much more after that - I did just grabbed a taxi, and headed for the Singapore/Malaysia border crossing - the Checkpoint - only to learn later that it was not the best option in terms of travel fare. 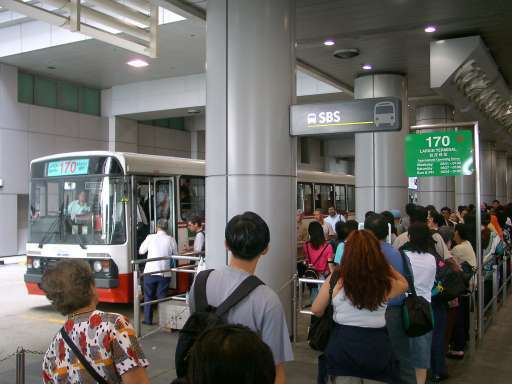 To get to the border and trying to figure out the possibly bus connections to take me further in the right direction took about the first two hours of the trip and I had yet not left Singapore. Getting to the border and trying to figure out the possible bus connections to take me further in the right direction took about the first two hours of the trip and I had yet not left Singapore. After still some adventures and questions in the best Singapore English / Malay I could muster, I did arrive at Johor and more specifically the southernmost Malaysian city Johor Bahru. Anyone who had actually been here would have known, as well as I do now, how utterly simple this trip could have been done - once you know how to do it, as is the case with most things in life I guess. Around here, things had started to become somewhat clearer but then my mobile telephone had died on me, since I was out of reach from the Singapore telephone company, to which I had my connection. I realized that the reason I had not found much information on where I was going was that the place in which Sten Sjöstrand has got his operation located is a small village called Endau. It is not really what we would call a tourist resort but more like an "End au the world" sort of place. A Swedish journalist who recently met with Sten there had commented on the place as "one where the rats was competing with the dogs in size". A tourist office in Johor Bahru finally managed to produce a map. From this I suddenly noticed, that Endau was the closest place on the map to the Tioman Island in the South China Sea. Now this all of a sudden made a lot of sense. The history of the Tioman island (or Pulau Tioman as it is known in Singapore and Malaysia), from the beginnings of written records on maritime trade and piracy of Pulau Tioman tells that it is a classical place for all kinds of sea adventures. And if there were wrecks to be found around anywhere in Asia - it would be there at Tioman. The cab station was located at the Larkin Bus Terminal where I would have arrived easy as pie if I had known that * smile *. The only driver who seemed to be interested in going all that way in the direction in which I was heading, was a nice guy with the oldest car I had seen rolling around outside the veteran car associations. The car functioned remarkably well despite its 20+ years on the road. I noticed though, that once the driver had got it going he never once turned off the engine, not even when we stopped for lunch later on. I guess his friends at the cab station all felt he needed the business and unanimously "gave" me to him. How to get there still remained a question, and after asking around some, the one remaining option was to rent a cab willing to go all the way. 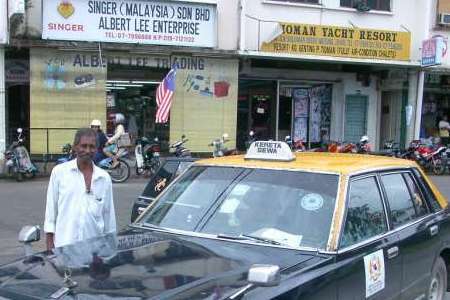 The cab central was located at the Larkin bus terminal, and the only driver who seemed to be interested in going all that way in that direction was a nice guy with the oldest car I had seen rolling around outside the veteran clubs. It functioned remarkably well though despite its 20+ years on the road, looking pretty much as battered as Russian space stations use to look in American Hollywood movies, and just about as likely to fall apart within minutes. After having walked a few turns around it, I decided that ok - the engine seemed to run - and with some luck it might survive one more day, and then I set forth towards Endau. We drove North for about two hours. The weather report had mentioned that heavy rainfall and thunderstorms could occur and that did indeed come true. It was awesome to see the wind tearing through the tops of the palm trees along the road just a few yards away from where the taxi drove. The heavy drops of the tropical rainstorm making the palm tops almost horizontal to the rural and rustic grounds with its wild exotic force of nature. After slightly more then two hours of driving - neglecting all speed limitations there might have been - partly because the speedometer was not functioning any more, we arrived at a city called Mersing. If I had wanted to go by ferry to the Tioman Island, this would have been the place for the changeover. Here, I also found the first public telephone booth after leaving Johor Bahru and could finally give Sten a call and tell him I was on my way and actually pretty close at that - as far as I knew. 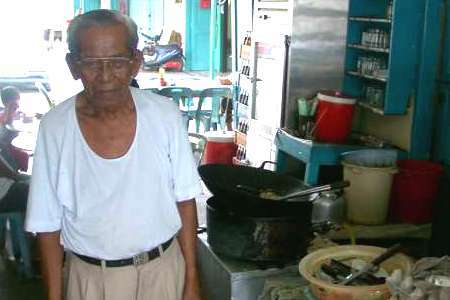 We decided the best would be if I had lunch in Mersing, and then one more hour of driving further North would take me to Endau, where Sten would meet me at the local gas station. We met at the agreed location after which I spent the evening looking through the piles of Si-Satchanalai (Sawankhalok district, Sukhothai) pieces, still in storage from the excavation of the "Royal Nanhai" 16th century cargo of Celadon ceramics - plus the very reason of my visit - a surface sample collection from the recently discovered 19th century and possibly "Straits Chinese" cargo. Other important reasons for this trip was also to look into the date of the Yixing tea pots Sten previously had sent us some pictures of (in the middle of the picture below as I saw them at the base camp). Now I can tell I have looked at an under water video recording from the wreck site - and there is no doubt whatsoever, that the tea pots belongs to the "Straits Chinese" cargo. As for a date the entire cargo seems to date to the 1830's. The teapots were all found stored inside large pottery jars - perhaps 50-100 tea pots in each jar. Some with their original and individual lids in place, some with their lids tossed around by trawls and fishermen's nets. The huge storage jars themselves were still solidly stuck deep down into the cargo, surrounded by porcelain plates, bowls and dishes in neat rows. Some pieces from the most recent "Straits Chinese" cargo find. 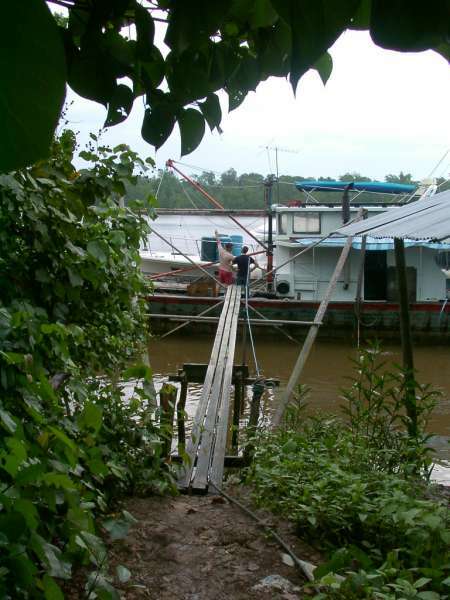 The sample pieces are brought up from this wreck for dating purposes and for to negotiate with the National Museum and the Malaysian government about excavation's rights and the salvaging. Most seems to date from round 1830. For you - I took the above picture of some of the sample pieces brought up from this wreck. They were all from the surface layer but still, a fair representation of the entire haul of goods from the cargo wreck. These samples are brought up for dating purposes and for to negotiate with the National Museum and the Malaysian government about excavation rights and the salvaging. 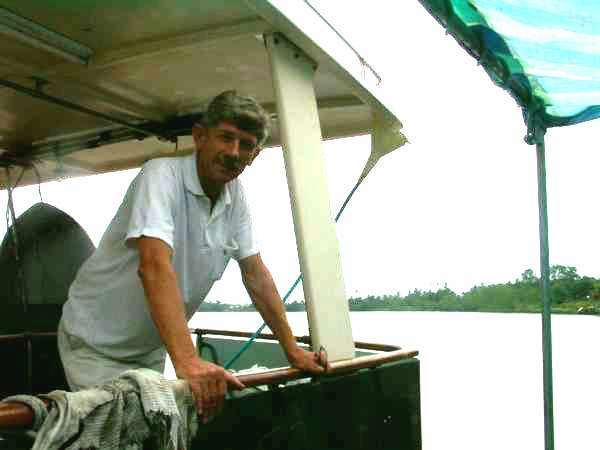 I would here like to extend my thanks to Sten Sjöstrand, his wife, friends and divers, for their hospitality and generosity with letting me stay the night in his yacht and for me to have full and free access to all there was of excavated and recovered material. I was duly impressed with the documentation and the research that has been done about the salvaged material, where the salvage team had adhered to strict scientific methodologies. Most of the night was then spent discussing Sten's forthcoming museum exhibition which will soon tour Malaysia - and the problems and possibilities which are connected to the dating of wreck sites, and the often contradicting information one gets when comparing traditional excavation data with the sealed time capsules shipwreck cargoes are. Below are a few more of the pictures I took from the base camp and its surroundings. 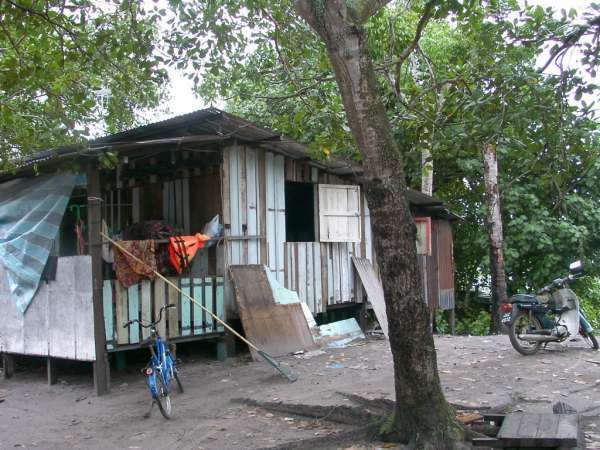 The villagers living close to Sten's base came belongs to the original population in Malaysia and since they have not given in to the Muslim society they get into all kinds of problems like getting their water supply cut off and such. Still they maintain their independence and pleasant hospitality, at no small effort. 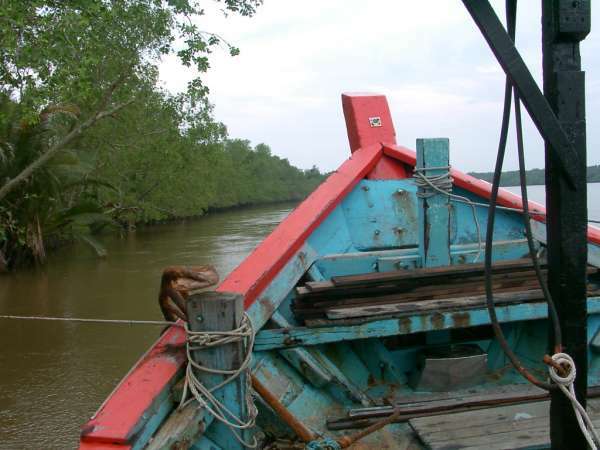 The fore of the Malaysian fishing boat Sten have acquired to use as a recovery boat for the forthcoming excavation. Sten Sjöstrand on his private yacht, doubling as guest lodge and base camp head quarter.